FoxSports.com has laid off around 20 writers and editors to focus on shifting to video. Today, we are announcing a plan to put the editorial strength and technical infrastructure of FOX Sports fully behind digital video. We will be shifting our resources and business model away from written content and instead focus on our fans’ growing appetite for premium video across all platforms. We are watching how fans consume content. Gone are the days of uploading content to a hub and hoping an audience seeks it out. We will be taking a proactive approach to distributing our content to sports fans on their preferred platforms. We are listening to our advertising partners. Our advertising partners want to be presented alongside premium video across all screens, so we will now focus on delivering high quality sports video content to support their efforts. Premium video is our advantage. 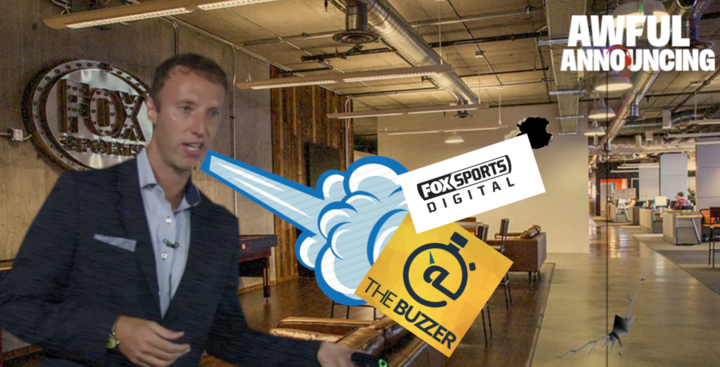 Creating compelling sports video content is what we do best at FOX Sports. We are going to be focused on leveraging our live event rights, talent and resources to create premium sports video content optimized for each platform. This evolution of our digital offerings is a continuation of what has always made FOX Sports successful: big events and incisive opinions. Producing compelling sports video is the connective tissue that links our first NFC season in 1994 to our current World Cup partnership that extends through 2026. It’s what links FOX NFL SUNDAY to daily opinion shows on FS1. Our strategy will be successful because it builds on and enhances everything FOX Sports has created over the past 23 years. I am excited to see what we can do together. Thank you for your continued hard work as our business evolves. What does that actually add up to? As Shaw notes, it means the elimination of around 20 writing and editing positions, and the creation of similar numbers of jobs in video production, editing and promotion. But this is only the culmination of months-long efforts by Horowitz to shift digital’s focus away from covering news and towards promoting FS1’s on-air personalities. In fact, writers sent to the Super Bowl in February were told once they arrived that they wouldn’t be writing for FoxSports.com, but would be ghostwriting copy for on-air talent instead. Digital executives like Pesavento and Mike Foss (both previously For The Win) have been pushed out as well, top writers like Bruce Feldman have been posting pieces on Facebook instead of on Fox’s site, and FoxSports.com has become more and more about what their debate show personalities say on-air. Awful Announcing will have a longform feature on what’s really behind these changes Tuesday. Chris Bahr (editor), Pete Blackburn (writer), Jonathan Bradley (writer), Dan Carson (writer), Chris Chase (writer), Cam DaSilva (writer), Lindsey Foltin (editor), Sam Garner (writer), Dan Graf (editor), Tom Jensen (editor), Dieter Kurtenbach (writer), Damon Martin (writer), Pat Muldowney (senior manager of social media), Caitlin Murray (writer), Andy Nesbitt (social media, The Buzzer), Brett Pollakoff (writer), Ryan Rosenblatt (editor), Nate Scott (editor), Chris Strauss (editor), Nick Schwartz (editor/writer), Aaron Torres (writer), Barry Werner (editor), Aaron West (writer), Tyson Winter (social media). News is making the rounds about FOX’s website moving away from written content. I should announce that I was among the cuts, unfortunately. As you may have heard, FOX Sports is making major changes to its editorial and digital approach. Unfortunately, I was among the cuts. Hello, possible bosses, between Jan 1 and May 26, my content pulled 81.478 million page views (and I can prove it). Nearly 4 years to the day of the start of my career with @FOXSports, today I learned it's over. I've loved every second of my time here. Since I don't have a job now, embed this tweet in any stories about the layoffs at FOX. I need your help here guys I never ask for anything. For the past 27 hours, FOX didn't inform me I was among yesterday's mass layoffs bc the new VP didn't know who I was. Wasn't the wedding gift I was hoping for, but I too am out at Fox Sports. Still gonna go enjoy my honeymoon. See everyone on the other side! Curiously, this story was posted at Bloomberg Monday just before Horowitz was scheduled to discuss the direction of Fox Digital with Awful Announcing as part of that longer feature. The Bloomberg piece also includes some material very favorable to Fox, including that “Fox’s strategic transition to opinion has worked thus far.” And they have a graph showing ESPN and ESPN2 both dropping nine per cent in average total-day audience last year, while FS1 improved 11 per cent; that’s nice, but is maybe a little less impressive when you consider that FS1’s bump got it to an average of 182,000 viewers (just 9,000 ahead of NBCSN, which spends much less on studio programming), while ESPN2 still averaged 245,000 and ESPN averaged 817,000. It’s easier to make a big percentage improvement when your numbers are small to begin with. Oddly enough, this comes two years to the day after FS1 cut back its TV news operation, which saw them folding on-air news updates into the digital At The Buzzer brand. That brand also seems to have fallen by the wayside; it hasn’t tweeted anything to its 647,000 followers since May, and its last eight tweets are just retweets of @UFConFox. Add that to the list of big Fox social accounts that are now unused, including @FoxSportsLive (216,000 followers, no tweets since Feb. 22, now locked). Our piece on those 2015 changes also discussed Fox “cutting back on live reporting for events it doesn’t have the rights to air” and noted “pundits and reporters will be doing much less traveling as a part of these moves.” This certainly seems to follow that theme. And it’s worth noting that Fox also laid off tons of writers at its regional and national sites back in May 2015. It’s also going to be interesting to see what this means for Fox’s digital numbers. Back in February, Sports Business Journal reported that the Fox Sports-SI Group-Perform Media (Fox, Sports Illustrated, Fansided, The Sporting News, 120 Sports, the National Football Post and more) group finished second amongst all sports sites with 68.7 million uniques in January, behind only ESPN’s 86.7 million. That put them ahead of such sites as CBS/247 and NBC/Yahoo. Those other partners will still be cranking out content, obviously, but are the FoxSports.com numbers going to take a hit now their site won’t feature original writing or news and will be so focused on video? We’ll have to see, but it’s certainly going to be worth watching. Stay tuned to Awful Announcing for much more on what’s behind these changes at Fox.